It seems like everyone in my flickr stream feature food in their weekend update. I’m not sure if there’s something in the air that requires comfort eating, but for me the weather is definitely making me rather peckish. Tonight is my turn to cook in our share household; something we do on a semi regular basis whenever everyone are at home. My theme is South East Asian, with Kangkung Belado being one of the dishes. 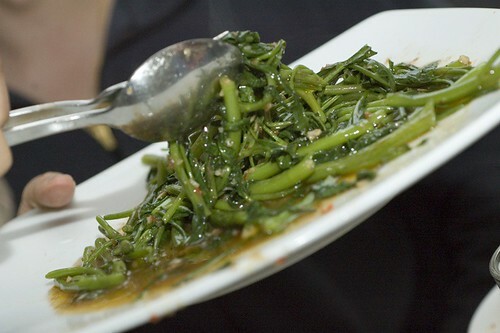 Growing up, Kangkung was one of the most common vegetables around in Indonesia. When we moved to Sydney, we count ourselves lucky if we can find it a few times in the summer. Explaining why I am so fond of this weed like vegetable is always rather interesting. Known as Kangkung, Kangkong, water spinach or water morning glory among many other names, it is like a crispier version of spinach. 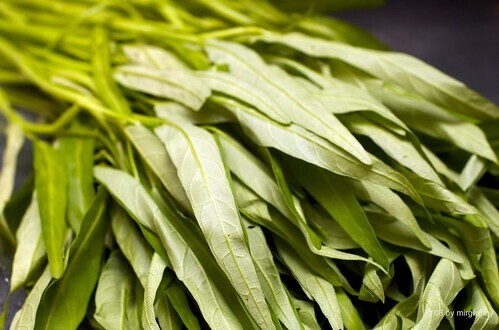 Kangkung is a great vegetable to stir fry with and soaks up sauces easily. With that in mind I made some Sambal Belado to go with it. This recipe is taken from the excellent SBS’s Food Safari website, the recipe creator Rohana Halim is the owner of Ratu Sari. A favourite family haunt when we want authentic Indonesian food. In a blender, blend tomato and shallots for 5 seconds, then add chilli. Continue blending briefly to a coarse paste. Heat wok over medium heat, add vegetable oil, and stir-fry the paste, add sugar and salt. Lower temperature slightly, and stir occasionally for 10-15 minutes, until the chilli becomes fragrant, mixture thickens a little and the colour has changed to deep red. There are a few things that I usually add to the recipe, the first is adding prawn paste and the second is a dash of kecap manis (soy sauce). Reducing the amount of chilli used is up to you, but it does taste better with a bit of a kick. Saying that, my hand is still burning from handling so much chilli. Assam fish curry and coconut rice the curry took forever and a day, but I really miss that combination of sweet and sour. What recipe did you use? I got mine from an episode of Food Safari, and it was tremendous. If I remember correctly, it didn’t take all that long to prepare either. I used the Food Safari one as well, but I couldn’t get the right combination of flavour for a while. Still getting used to the different assam and other things.